Ariane Resnick is a private chef and certified nutritionist who creates indulgent, seemingly “normal” food out of clean, whole food ingredients. She has cooked for celebrities including Gwyneth Paltrow and Matt Groening, and has been featured in media such as InStyle, Star, Huffington Post, Refinery29.com, Men’s Fitness and the Food Network's "Chopped." For the first time in awhile, America’s hottest superfood isn’t green. In fact, it isn’t even a vegetable. 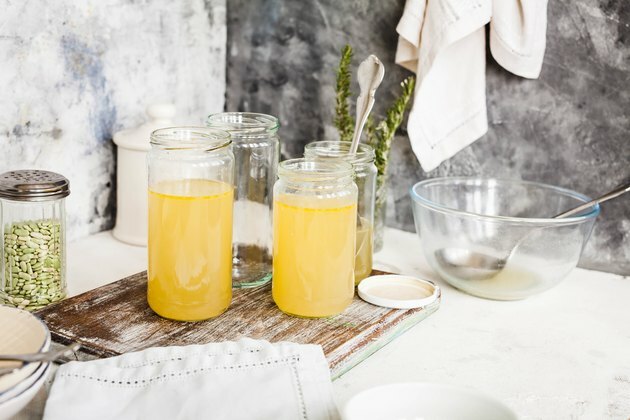 Simple and affordable, bone broth is an ancient food leaving its mark on our culture. Often mistaken for “stock,” bone broth is different due to how long it cooks for and that you don't need meat and aromatic vegetables to make it. The boxed stock available at supermarkets is a liquid; bone broth is cooked long enough for gelatin and collagen to be released from the bones and will gel into a solid when cold. Bone broth naysayers might say it's just soup or stock, but what they don't realize is what a huge difference the bones' cooking time can make to their nutritional properties. The act of extensively cooking bones pulls out an array of minerals, amino acids, gelatin, collagen, chondroitin and hyaluronic acid that become part of the broth. Adding cider vinegar to the bones aids in the extraction of minerals. Bone broth is making a resurgence, but it’s important to note that in many cultures it never fell out of favor. Jewish people have long considered chicken soup a cure for the common cold, and Asian “long life” broths have remained a dietary staple. It feels like a trend because we’ve moved so far away from homemade food that many dishes are a lost art now — especially time-consuming ones. The good news is that modern appliances make it simpler to make your own: One to three hours of slow cooking is a welcome replacement to an overnight stovetop situation. If you’re concerned about having the “right” bones on hand, rest assured that any you have saved will make a great introductory batch, even if they’re cooked, provided they are grass-fed if beef or lamb and organic if chicken, turkey, game or pork. Grass-fed meat is anti-inflammatory, while grain-fed meat is inflammatory because it’s high in omega-6 and low in omega-3. Conversely, grass-fed is high in omega-3 and low in omega-6. In the American diet, it’s common to overconsume omega-6 fats and underconsume omega-3s. People regularly seek ways to get more omega-3s into their diets, with one goal being to reduce inflammation. Grass-fed meat is an easy way to incorporate more omega-3 essential fatty acids. Ideally, bone broth should be made with grass-fed beef, as you then also receive beef’s conjugated linoleic acid, omega-3 and alpha linoleic acid, but other animals contain all other nutrients discussed, and many people find the taste more palatable. As far as food trends go, bone broth is the most economical one yet because it utilizes a main ingredient that is something most people otherwise throw away. While you may add aromatics such as carrots, onions, garlic, celery or herbs for flavor, it’s not necessary. NOTE: If you’d rather make a different quantity, use the ratio of one pound of bones to one quart of water, with one teaspoon of salt and half a tablespoon of vinegar per pound of bones. In a stockpot, pressure cooker or slow cooker, add bones. If raw, brown if desired to increase flavor. If using bones with fat, such as chicken backs, drain oil after browning. Add water, salt and vinegar. Cover and bring to boil. Reduce heat to a simmer and cook one to three hours in a pressure cooker, 24 to 48 hours in a slow cooker, or 12 to 24 hours stovetop. Add water as needed to stovetop or slow cooker, and skim fat and film as it cooks. Strain out bones and add salt to taste.